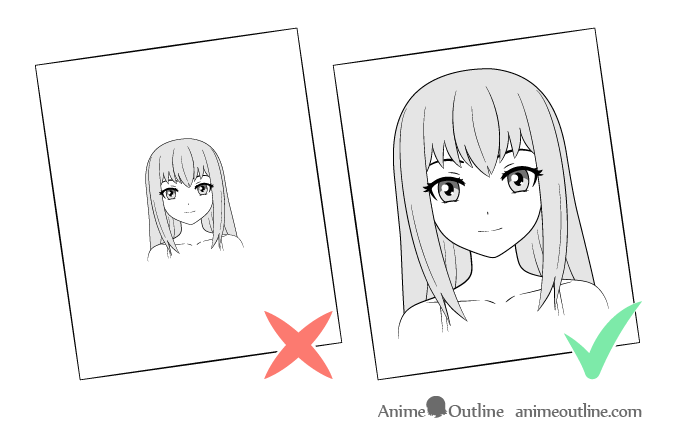 This tutorial lists some common mistakes people make when drawing anime or manga and when drawing in general. It also provides tips on avoiding and fixing these mistakes. 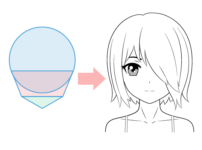 There are plenty of tutorials here on AnimeOutline that teach how to draw various things. This tutorial is slightly different as it will also show some examples of how NOT to draw. Probably the most common mistake for beginner artists is line quality. The first mistake is drawing a line by making a series of small strokes. Not only does this make drawing much slower but you also tend to get uneven looking lines or lines that looks like scratches. The second mistake is drawing extra overlapping lines when they are not needed. This can sometimes appear to make a sketches look “better” but that’s not really the case. What is actually happening is that once you make enough lines one of them is likely to be in at least roughly the right place. Your eyes then see that line giving the perceptions that the drawing is “improved”. Third are wobbly lines (where they should be steady). Though this mistake may not always be deliberate. Sometimes you might just need to practice more to get a steady hand. Definitely DO NOT draw this way on purpose where it’s not needed. If you look at most anime and good quality manga they tend to have very clear well defined line drawings. 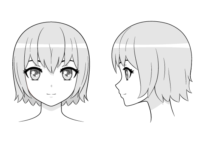 If you want to get better at drawing anime you should do what the professionals do. Try and draw with long steady lines and avoid unnecessary scribble. For making really long lines it’s a good idea to draw from the shoulder instead of drawing from the wrist. In other words instead of moving your wrist when you draw these lines move the shoulder/elbow part of the arm. Drawing from the wrist is better for drawing smaller details. 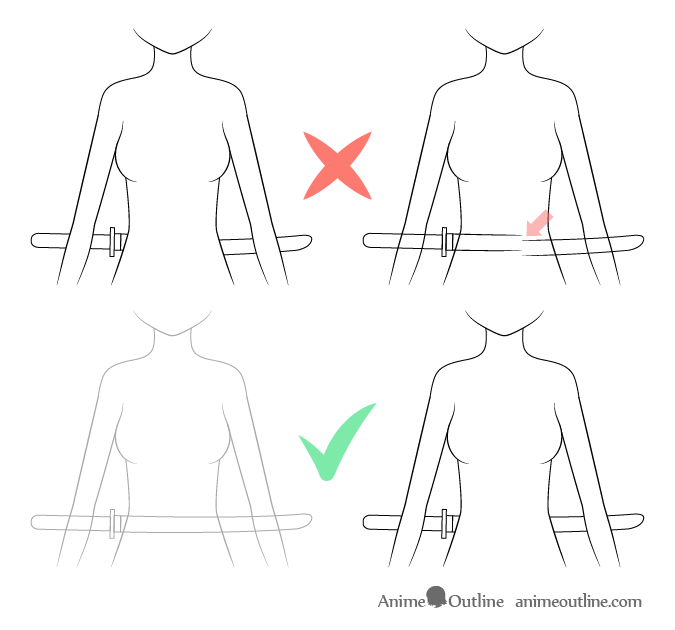 Line weight is another common mistake beginners tend to make. 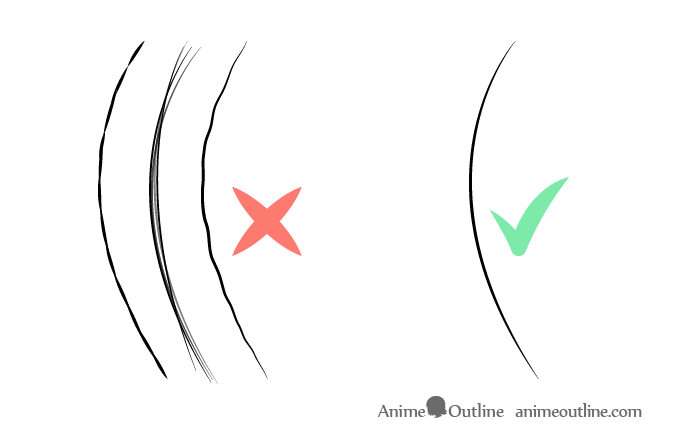 Even if you have good line quality (long steady lines) you should still be aware of line weight. Making lines that are too thick can make your drawing look bad. 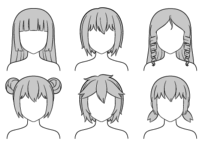 In anime the lines are generally fairly thin in relation to the characters with no line weight variation. Manga on the other hand are more likely to have drawings with varying line thickness. If you want to make a drawing that looks like a screen capture of most anime use thin lines through the whole drawing. 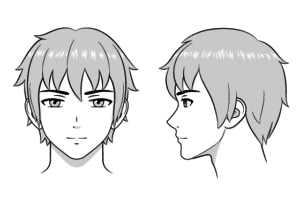 For more manga style looking art you can use thicker lines to define the main shape of an object and thinner lines for the smaller details. 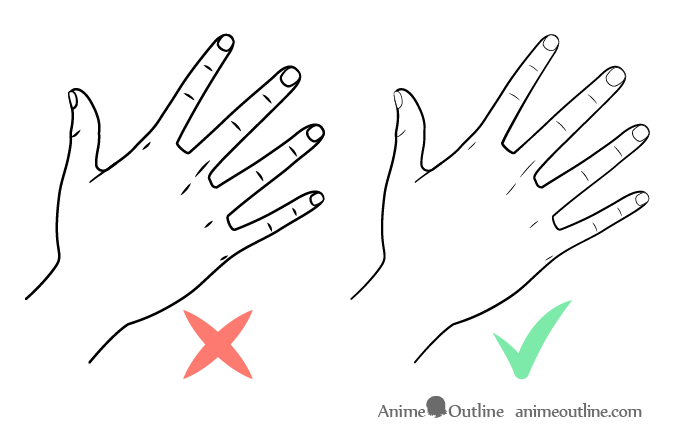 As in the hand drawing above you can see that in the second example the main shape of the hand has a thicker outline while thinner lines are used for the small details such as the fingernails. This mistake is especially common to digital drawing as it allows easy access to dark or bright colors that are difficult or impossible to reproduce on paper with things like pencil crayons. One common coloring mistake is picking colors that blend with one another or blend with the black outlines of a character or an object. If you want to use darker colors make sure the outlines of the drawing are not lost when you apply it. Draw white or light color outlines for that part of the drawing. Perspective is objects getting smaller as they go off into the distance. Drawing in perspective is being able to show this in a believable way in art. Drawings with no perspective simply look odd. Generally even people who are not artists can tell somethings is off about them though they may not always be sure what it is. When it comes to anime and manga perspective is especially important for background objects or for getting more dramatic looking scenes. When drawing something that’s supposed to be symmetrical it’s very easy to make a mistake where the drawing is actually uneven. To help avoid mistakes draw some guide lines to help you. 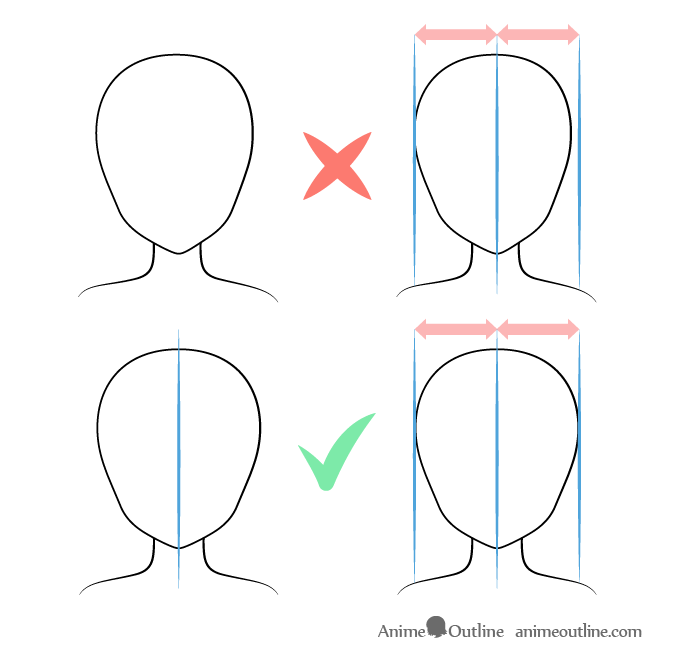 For example if you are drawing the head as in the example above it’s a good idea to draw a line down the middle of where you want to place the head. This will help you insure that both halves are more even. Another very common mistake is when different parts of the same object are actually drawn misaligned when part of that object is hidden. In the above example if you extend the lines of the sword/sheath in the first example you can see that they actually do not align. In order to avoid such mistakes you can do a light “see through” sketch of the whole object to make sure that both ends are placed correctly. Simply erase the hidden parts afterwards. 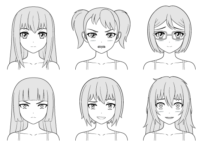 Some styles may look similar to anime but they are not quite “anime”. 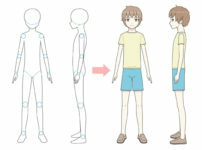 Even professional or semi-professional artists often make this mistake and draw characters that look more like dolls or cartoons. 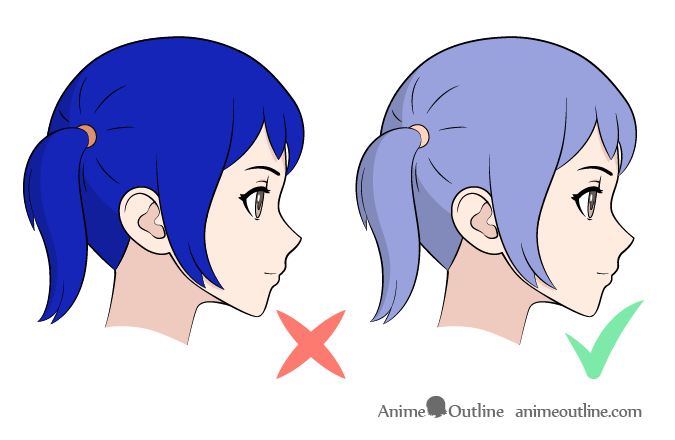 There are anime and manga characters that are exceptions to some of these “rules” but generally if you want an anime look you have to be careful to stick to the style. 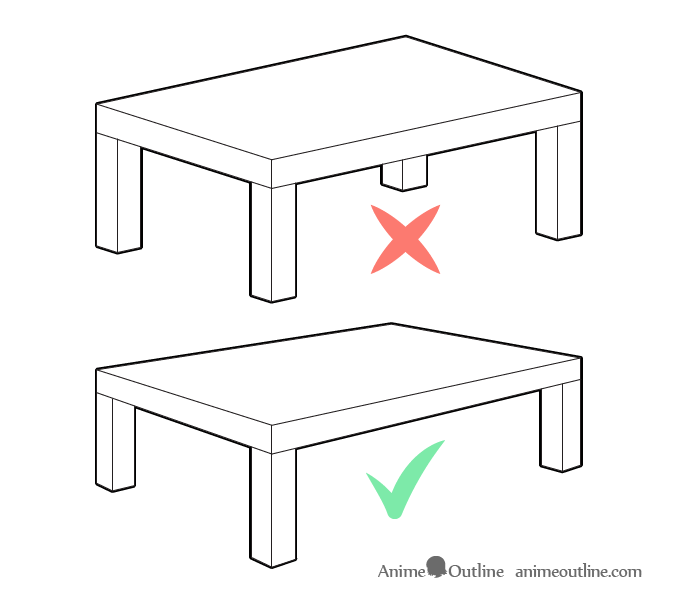 Making a drawing that is too small (or too large) for the drawing area is yet another common mistake many beginners make. It’s fine to draw small characters if you also want to show the scenery behind them. For example if you want to show a character that’s lonely you can draw them very small with a large empty room around them. It’s also fine to make many small practice sketches on one sheet of paper. 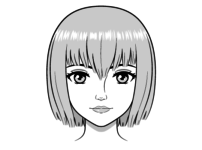 If however you want to make a portrait style drawing of a character like the example above try and make your drawing fill up a good amount of the page. At the same time leave a good amount of “white space” on the sides or your drawing will look crammed. It’s very easy to make mistakes when drawing just about anything even as a professional artist. The important part is being able to catch and fix them. Hopefully this tutorial helped you get more insight in to what you should look out for. 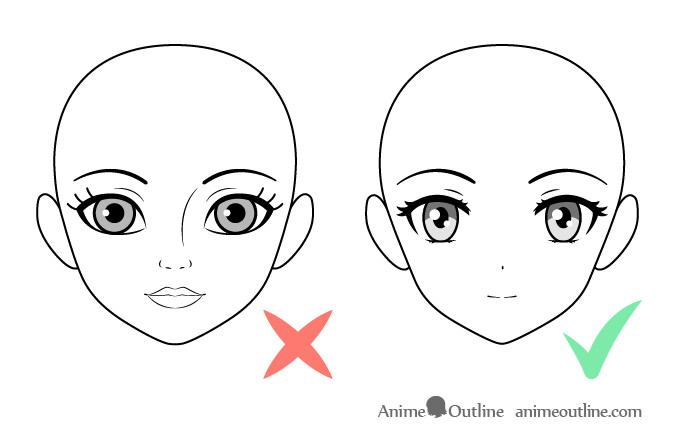 Don’t forget to check out the many other tutorials here on AnimeOutline for more on drawing in the anime and manga styles.